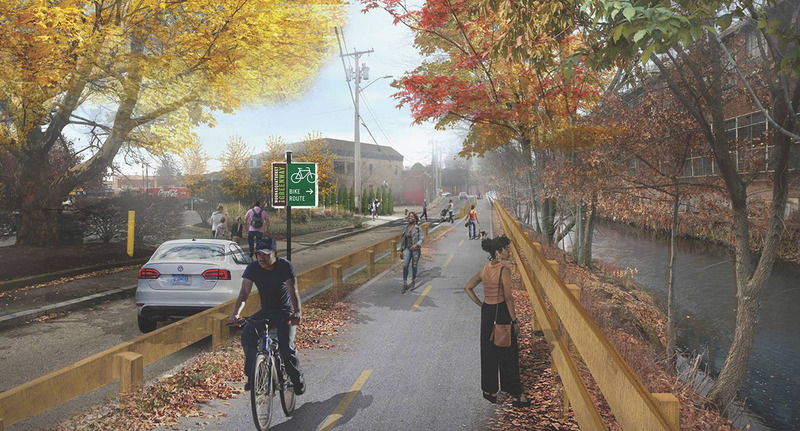 Come learn about improvements along San Souci Drive behind Olneyville Square that will: create a welcoming gateway between the Woonasquatucket Greenway and Olneyville Square; beautify and improve public access to the River; make it safer for people to walk and ride bicycles in the area; and reduce stormwater runoff into the River. Olneyville Square has so much potential. If traffic can be reduced through the square and the sidewalks can be enlarged, it could be a very pedestrian friendly ‘square’. There should only be one lane of traffic in each direction, and maybe a dedicated bus lane (bi-directional through the square). Traffic needs to be funneled onto the highway, and off local streets. Add speed bumps on the single lanes, for good measure. Add a large fountain at the center of the square, and make the landscaping very nice. Apartments can be added on top of some of the stores, presenting mixed use opportunities. Olneyville already has Fete and used to have Therapy (Dusk 2 Dawn, was its latest name), WaterFire center is a short distance away, as is the theater company that moved into the Rising Sun Mills. Olneyville Square could become an entertainment district. Every time I drive through the square, I always say… restaurants with outdoor seating would be great here if there wasn’t so much traffic. The area I am talking about is right in front of the shops with the outside sales and the fried chicken restaurant. Olneyville should also have its own train station to serve everyone on the West Side. So what you are suggesting is further gentrification of the west end …. basically. Just keep pushing the lower income families out of dodge. The vision is a cute one tho. seems to me improvements in the Olneyville area are needed and desirable no reason low income neighborhoods should keep bad conditions. “Gentrification” is a word for neighborhood improvements and low income people benefit from such- better food stores, less thru traffic, safer streets, and yes, bike lanes, especially desirable there as auto ownership is much lower than in the suburbs. But some protection is needed for people already living there from exorbitant rent increases, condo conversions etc.